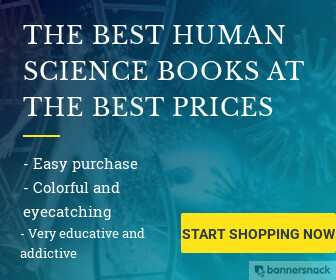 Aadeel Akhtar, an M.D./Ph.D. student at Illinois, developed a control algorithm to give prosthetic arm users reliable sensory feedback. "We're giving sensation back to someone who's lost their hand. 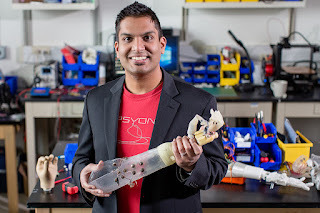 The idea is that we no longer want the prosthetic hand to feel like a tool, we want it to feel like an extension of the body,"
said Aadeel Akhtar, an M.D./Ph.D. student in the neuroscience program and the medical scholars program at the University of Illinois. Akhtar is the lead author of a paper describing the sensory control module, published in Science Robotics, and the founder and CEO of PSYONIC, a startup company that develops low-cost bionic arms. "Commercial prosthetics don't have good sensory feedback. This is a step toward getting reliable sensory feedback to users of prosthetics,"
Prosthetic arms that offer nerve stimulation have sensors in the fingertips, so that when the user comes in contact with something, an electrical signal on the skin corresponds to the amount of pressure the arm exerts. For example, a light touch would generate a light sensation, but a hard push would have a stronger signal. However, there have been many problems with giving users reliable feedback, said aerospace engineering professor Timothy Bretl, the principal investigator of the study. During ordinary wear over time, the electrodes connected to the skin can begin to peel off, causing a buildup of electrical current on the area that remains attached, which can give the user painful shocks. Alternately, sweat can impede the connection between the electrode and the skin, so that the user feels less or even no feedback at all. "A steady, reliable sensory experience could significantly improve a prosthetic user's quality of life,"
The researchers tested the controller on two patient volunteers. They performed a test where the electrodes were progressively peeled back and found that the control module reduced the electrical current so that the users reported steady feedback without shocks. They also had the patients perform a series of everyday tasks that could cause loss of sensation due to sweat: climbing stairs, hammering a nail into a board and running on an elliptical machine. "What we found is that when we didn't use our controller, the users couldn't feel the sensation anymore by the end of the activity. However, when we had the control algorithm on, after the activity they said they could still feel the sensation just fine,"
Adding the controlled stimulation module would cost much less than the prosthetic itself, Akhtar said. "Although we don't know yet the exact breakdown of costs, our goal is to have it be completely covered by insurance at no out-of-pocket costs to users." The group is working on miniaturizing the module that provides the electrical feedback, so that it fits inside a prosthetic arm rather than attaching to the outside. They also plan to do more extensive patient testing with a larger group of participants. "Once we get a miniaturized stimulator, we plan on doing more patient testing where they can take it home for an extended period of time and we can evaluate how it feels as they perform activities of daily living. We want our users to be able to reliably feel and hold things as delicate as a child's hand,"
"This is a step toward making a prosthetic hand that becomes an extension of the body rather than just being another tool."